On Aug. 27, Jars of Clay will release a new album called Inland. To pass the time, I am going to count down my favorite 19 Jars of Clay songs. Oh wow, what happened to me? I was chugging along just fine with posting one per day, then nearly two weeks go by and no posts! Actually, it's the fact that I have a new job! Working overnight, and that schedule took some getting used to, so my normal activities took a huge hit. No matter now, because I'm able to bring you most of the countdown in one spot, with some brief notes on each song. Then Sunday and Monday, you get number 2 and number 1. Fair deal, right? Probably my favorite song around Christmas time (and year round, according to this newspaper article!). I didn't even know this was an actual Christmas song when I first heard it. The music video actually makes this song better than it is. Baby Jesus and a flying taco! Beautiful song, mostly due to the inclusion of the African Children's Choir. The song is a love song to the most poverty-stricken people on that continent. And with Jars of Clay being very heavily involved in Blood:Water Mission, whose goal is to bring clean water to Africa, the song actually has some weight to it rather than just being lip service. Remember how I listened to Overjoyed nonstop during my parents divorce? Consider this one to be part two in that trilogy. I listened to this song in particular so much when I got The Legend of Zelda: Ocarina of Time for the N64 back in 1998 that the two things are forever intertwined in my head: I can't play the game without this song, and I can't listen to this song without thinking of the game. This is just a fun little song, with very haunting lyrics (and the favorite song of my most recent Dustin Faber Show co-host, Fr. Darryl Millette). The organ and strings sell this song to me. And part three in the trilogy of Jars of Clay helps Dustin cope with his parents divorce. 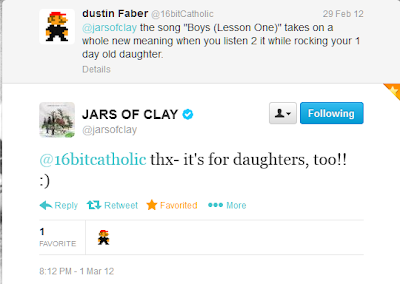 Musically, I think this is the most beautiful thing that Jars of Clay has ever done. When I hear this song, especially the beginning, I just picture myself walking through a beautiful forest or field, birds singing and perfect weather. Anytime a song can put you in a completely different place, the artist has done something right. Their big mainstream hit! And it's not even in my top five (the songs ahead of it have more replayability than this one). Still, I remember going to Super Summer in 1997, and hearing it blaring over the speakers before evening worship started. Chuck Owens and I both agreed: This song was amazing! It was the second time I'd ever heard a song in a Christian setting that sounded good outside of church (dc Talk's Jesus is Still Alright having the distinction as the first). If you can track down the Adrian Belew remix, it replaces the acoustic guitars with electric, but the original still holds a special spot in my life. This song really meant more to me recently when I was applying for a job for a certain church group. I nailed my interview, and felt VERY strong about my chances at getting the job. It seemed like everything was lined up for this to work out. And it didn't. And that was a huge bummer. As motivation, I have their rejection letter (sent three weeks late mind you) framed above my desk, with a copy of the lyrics to this song. No matter what comes along, God will lift up my head. Based on my experiences with this song, it should probably be number one. From a music and lyric standpoint, it's top five. From my personal standpoint alone, it's the greatest song ever. Why the contrast? I like the four songs ahead of this more just when listening to them on my iPod or stereo. However, this is the song that I danced with my mother to at my wedding reception, telling her that when I needed it the most, she always had a hundred reasons that showed me how much she loved me (paraphrasing the lyrics there). And when my daughter Lucy was born, this was the first song she ever heard. Daddy sang it to her when she was one day old. What a great, great memory I'll never forget. Amazing, how the best song on The Shelter, the album filled with guest-spots from the best that Christian music has to offer, is the one that Jars did by themselves. 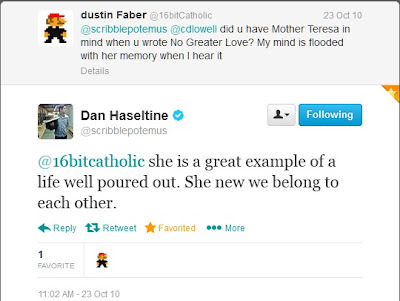 This song makes me think of Blessed Mother Teresa immediately, to which Dan Haseltine thought was fitting. Musically, I really enjoy the piano throughout the song and the guitar riff that leads into the chorus. This just a nearly perfect song. While Flood may have gotten me interested in the band, Liquid is the song that kept me a fan. For some reason, I thought the Flood song I heard was Liquid when I first put the CD in. An honest mistake: they're talking about swimming int he song, and here's something called Liquid. But it wasn't Flood. It was something better. Something amazing. When that string section hits, my God, it was the most amazing thing I'd ever heard. The Gregorian chant is used perfectly, but the only gripe I have with this song is that the drums are criminally underused: 1:06 to 1:15 is my favorite nine seconds in any song, but you never hear that drum solo again. You can hear it through the rest of the song, but not as loudly. The lyrics are a great way to convey Christ's love without sounding too preachy (arms nailed down, are you telling me something, eyes turned out, are you looking for someone). If anything, you could say that this reeks too much of 1990s rock music, and perhaps that's true. It does feel kind of dated, as great as it sounds. You're not going to be able to play this for a middle school kid in hopes that they'll get turned on to the band. Fortunately, the cover on Live at Gray Matters feels more up to date while retaining what makes the song great, namely the strings (I can't stand the cover they did for Furthermore though, as it was slowed down big time and ruins what was great about the song in the first place, which is an upbeat sound and a great string section). Tomorrow, you get number two in the countdown, I promise.